But fortunately for us, this information was revealed to Rey by the villain of the trilogy, Kylo Ren, who was trying to manipulate Rey to help further his own power. It would only be to his advantage to lie to her and say that Snoke bestowed him a vision of her parents buried in a pauper’s grave on Jakku, as this doesn’t make a lot of sense for two reasons. For one, Rey’s parents left Jakku, so the odds that they returned there only to die before they could find Rey are slim. Secondly, it’s more than probable that if Kylo Ren was sincere in what he said, that the vision that he saw was merely another one of Snoke’s manipulations to conceal Rey’s true parentage. But would Snoke want to hide Rey’s true parentage from Kylo Ren? He might, especially if he was concerned how he would react if he learned that Rey was his sister. While it’s been long speculated that Rey could be the possible child of Han and Leia given their reactions to her in The Force Awakens, many have countered this theory with the simple fact that Leia doesn’t seem to remember having a daughter. Does she step forward to hug Rey before consoling Chewbacca? Yes. Does she send Rey on her husband’s iconic ship to find her missing brother who would (probably) have no idea who she is? Yes. But other than that, you’d think that Leia would have let slip by now that she had had another child, and that Rey was possibly her. That’s where Qi’ra comes in. If you’re unfamiliar with the name, Qi’ra is Han’s love interest from Solo: A Star Wars Story. While the story takes place long before Han and Leia are involved, their relationship still feels like unfinished business. While the possibility of a Solo sequel was briefly discussed, its less than stellar box office numbers seem to have been a nail in a coffin for a sequel, as soon after its debut, Lucasfilm announced the possibility that they would be halting future standalone Star Wars films altogether. This leaves the possibility of Qi’ra’s fate open-ended, but does it mean that she could possibly be Rey’s mother? 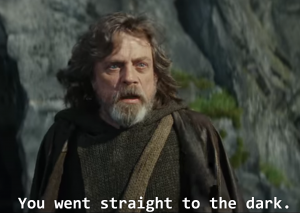 Youtube user Film Threat has seemingly put the pieces together, and while it sounds like something out of fanfiction, the theory actually makes a lot of sense in how it relates to the bigger picture of the Skywalker saga. Their theory begins by reminding us that Qi’ra is not only Han Solo’s first love, but that she also has ties to the dark side. While Qi’ra wasn’t revealed to be a Force user, the dark side is something that Rey is shown to be struggling with. When she does begin her training with Luke on Ahch-To, he observes that she goes straight to the dark side, instead of withdrawing from it. The theory then grows a little weaker, saying that the reason that Kylo Ren hated Han Solo so much is because he left his own family to start another with Qi’ra. In the book Last Shot, Han is shown to embrace fatherhood. While The Force Awakens hints that Han did leave, it seems to be because of Ren’s struggle with the dark side, and no other reason is mentioned for his departure. Yet, in the book Bloodline, Han and Leia seem to be on good terms with one another, albeit in a long term relationship as they both focus on their respective work. Now, Han may be a scruffy-looking nerf herder, but it seems hard to believe that he would ever cheat on Leia, even with an old flame like Qi’ra. But accidents and one night stands do happen and shows like Maury exist for a reason. Is it likely that Han cheated on Leia with Qi’ra and their affair produced a daughter, Rey? No. Is it possible? Yes. It would also explain why the Force is connecting Kylo Ren and Rey. 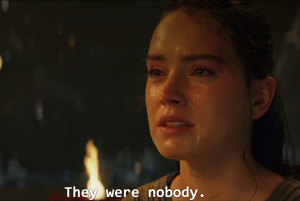 Kylo Ren deliberately asks why the Force is connecting them in The Last Jedi, and even though it is later revealed that the connection is brought about by Snoke, it really does nothing to explain the initial connection they felt towards one another when they first met, or how Rey was strong enough to hold her own against his Force powers when she was being tortured by him in The Force Awakens. It’s possible that this connection reflects the connection that we saw between Luke and Leia, who felt a connection to one another long before they realized they were siblings. Now here’s where the theory gets good. Let’s say Han Solo really is Rey’s father. That would mean that Kylo Ren is the daughter of Leia, someone of the light side, and yet he chose the dark side. It would mean that Rey, who was born to someone who embraced the dark side, decided to overcome her dark impulses to choose the light side. It would show that Kylo Ren and Rey were opposite sides of the same coin, and help to further the overall Star Wars ethos of bringing balance to the Force. So worry not, Star Wars fans. Rey Random just might actually be Rey Solo after all. So what do you think of this theory? Do you think that Qi’ra could really be Rey’s mother? Let us know what you think in the comments below and keep checking back on our Episode IX updates and spoiler list for the latest Star Wars updates! 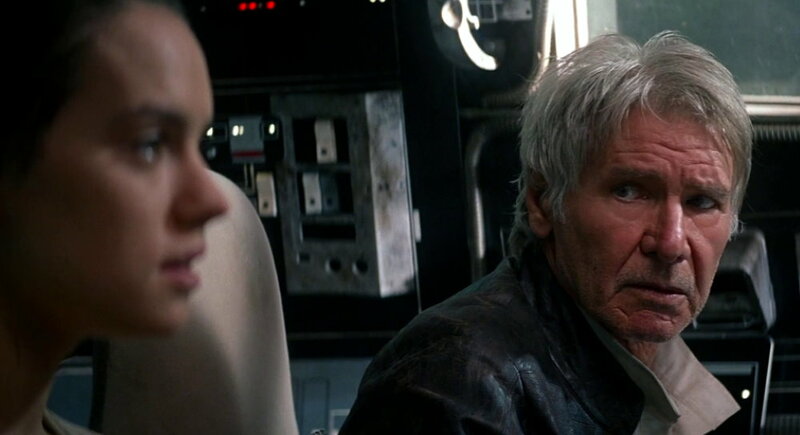 Unless Han had cheated on Leia, while he was in his 40s or 50s, there is no way he could be Rey’s father.